Many years ago a young family moved to Jamestown, NY from the New England area. The father, Roy, was a good man. The mother, Stella, worked outside of the home because times were hard and money was scarce. She began working in the public school system in Ashville, but then a job opened up at the First Congregational Church in Jamestown. At that time, the church job actually paid more money than the teaching one. As part of her new duties, Stella organized a training event for all of the teachers in the local churches. When she went over her list of the churches in Jamestown, she saw that there was one that met in a store front on Second Street. Coming from an established background of solid Congregational churches, Stella was unfamiliar with store-front churches. She thought that this church consisted of foreigners, too poor to own their own building. Being the conscientious person that she was, Stella decided that this church needed to be included in the invitation. It would be a decision to have far-flung effects. But who should go to this church to invite them? “I will,” volunteered the faithful husband. So on a Sunday night Roy attended the fledgling C&MA Church. He stood before them and explained what the event was, and informed them that they could bring their own sack lunches to eat during the meeting –which was being held in their church building. Eating in church was frowned on by the good Alliance folk, but they graciously listened and then proceeded with their service, which Roy remained for. The man was moved by the vibrant music of the little orchestra and he began to attend their evening services. In the morning he attended his own church, but at night he found his way back again and again to this little store-front church. The church had two doors from which you could enter and exit. If the pastor happened to be standing at the front door, Roy was very careful to exit from the back door. Whichever door the pastor was near, he always found his way out by the other door. And so, no one learned his name. It wasn’t that they did not care about the man. He was just elusive. 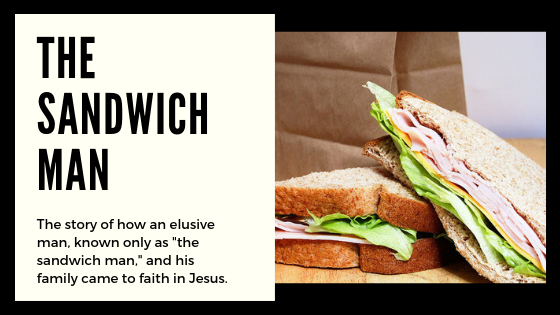 So, not knowing his name, the group of believers dubbed him “the sandwich man” and began to pray for him. Meanwhile, Stella was busy about town. Since she did not have a car available, she walked everywhere. About that time another family moved to Jamestown, the Morse’s. While making her rounds about town one day, Stella encountered Marjorie Morse, who had four children. Dutiful as ever, Stella sidled up to Marjorie, and her four prospective Sunday School students. The friendship may have started with the thought of the new prospects for Sunday School, but Stella discovered she really enjoyed this woman. Besides, her house was a good resting point on many of her journeys. This woman also liked Stella, and felt strangely drawn to her. Finally, when the journey stopovers had continued, Marjorie decided she should invite Stella and her family to dinner. Were the Morse's ever surprised when Stella arrived with the “sandwich man,” Stella’s husband. Marjorie realized this was divine …..so she invited them back again the next Saturday night. Only this time she invited the pastor too. The next Saturday night she had them all back again. And the next. This went on for a whole year until finally the pastor felt it was time to speak to Roy about his soul. Roy had some background with the Free Methodists, so he was a little more prepared for this than Stella. He had also attended all of those Sunday night services. He gave his heart to the Lord right then and there. Stella was not so easily convinced. She too had been searching, but her search had taken her elsewhere. She had written to California and was reading all sorts of books on universalism. Eventually she too came to put her faith in Jesus as her Savior. She asked the pastor who she could give these books too since she no longer felt she wanted them. The pastor didn’t think it was a good idea to pass that type of teaching on, so they decided to burn the books. He came to the house, and in the old fashioned furnace in the basement, a young Emily watched as her mother burned the books she had worked so hard to purchase. It spoke deeply to Emily of her mother’s commitment to her new-found faith. This is just one of the stories from a fledgling store-front church with members that prayed for the “sandwich man” and invited his family to Saturday night dinner for a whole year, and how God brought it all together to bring a whole family into His Kingdom. Roy and Stella Newell became gifted Bible teachers in the church and are still remembered by some today for this. Their oldest daughter, Marjorie Newell, went to Nyack College and went on to be a missionary in the Appalachian Mountains. She later married a pastor and they served in several African American churches until her untimely death. Emily Newell, the youngest daughter, left her legacy on many people’s lives in the Jamestown C&MA church and elsewhere as she taught Sunday School classes and Bible studies well into her 80’s, led AY, prayed in various prayer groups, gave wise counsel and lived out a vibrant Christian faith.